Fast enough to keep up with the action. 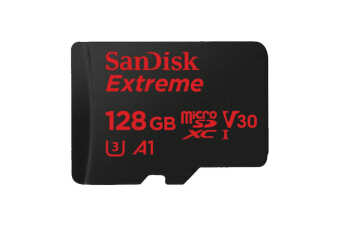 Ideal for your Android smartphone, action cameras or drones, the SanDisk 128GB Extreme microSDXC 160Mb/s Class 10 UHS-I SD Card does 4K UHD video recording, Full HD video and high-resolution photos. The SanDisk 128GB Extreme microSDXC 160Mb/s Class 10 UHS-I SD Card reads up to 160Mb/s and writes up to 90Mb/s. Plus, it’s A2-rated, so you can get fast application performance for an exceptional smartphone experience. Quick read speeds of up to 160Mb/s let you transfer 1000 high-resolution photos and 30 minutes of 4K video (24GB) in less than 3 minutes. Capture fast-action photos or shoot 4K UHD video with write speeds of up to 90Mb/s. The SanDisk Extreme microSDXC UHS-I card lets you shoot more and faster. With 128GB, the SanDisk Extreme microSD UHS-I card lets you capture 4K UHD and Full HD video with its UHS Speed Class 3 (U3) and Video Speed Class 30 (V30) ratings. Ideal for recording outdoor adventures, weekend trips or sporting events without skipping frames! The SanDisk Extreme microSDXC UHS-I card is shockproof, temperature-proof, waterproof and X-ray-proof, so you can enjoy your adventures without worrying about the durability of your memory card. The SanDisk Extreme microSDXC UHS-I card is compatible with MobileMate USB 3.0 microSD card reader with transfer speeds of up to 160Mb/s, so you can move big files fast, move a lot of files fast or just make frequent file transfers that much quicker. The card comes with RescuePRO Deluxe data recovery software. This software makes it easy to recover files that have been accidently deleted (download required).